A wedding celebrates the joining of families- not just two people. What better time than your wedding to pay homage to the worlds you’re bringing together? It’s important to know our history; being familiar with our heritage helps us fully appreciate our present, and be intentional with our future. Like many Americans, I claim a healthy dose of Irish in my background. For this particular post, we’re exploring ways to celebrate Irish wedding traditions- however, these concepts span the globe, so read through and apply the ideas to your own cultural roots. In many countries, including Ireland, the historic color for dresses was blue because it symbolized fidelity. A pastel gown could be a wonderful way to adapt Irish wedding traditions in a modern way. Think of how flattering, versatile, and utterly romantic a blue dress could be! Click here for a post dedicated solely to the beauty of blue dresses. 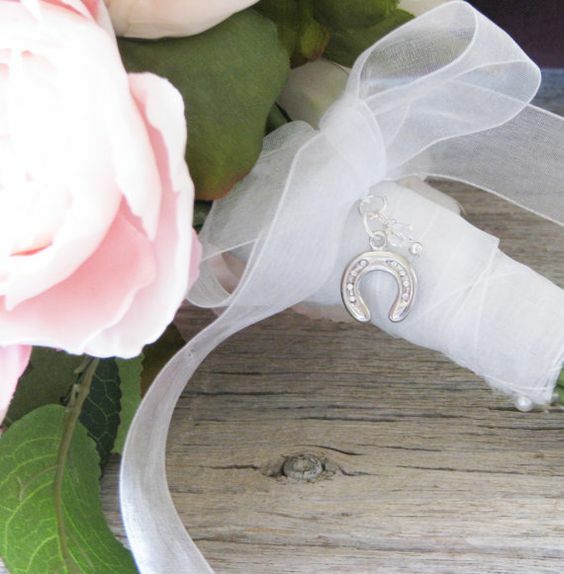 Brides used to carry a horseshoe with them to ward off bad luck. However, you don’t need to haul around agricultural metal. A delicate pendant attached to your bouquet is a more fitting for a modern, Irish-American bride. When it comes to the floral choices, consider incorporating herbs and wildflowers into the design. In Irish wedding traditions, brides carried herbs to ward off evil spirits; however, present day brides are turning to herbs again due to their beauty, versatility, fragrance, and a certain “je ne sais quoi” pop of the unexpected. Your Irish ancestors probably wore their hair braided and laced with more herbs and flowers. Historically, these were choices of practicality- now braids and romantic flowers stylish choices for wedding hairstyles! Did you know, the shamrock isn’t Ireland’s symbol? Dagda’s Harp is the country’s official emblem. Enlist the talent of a harpist for your ceremony and/ or cocktail hour. Can you imagine a more elegant nod to your roots than gliding down the aisle to its angelic sound?! (Btw, this glorious little room is right here in Memphis at this Victorian venue). Similar to unity candles, and sand, in Irish wedding traditions, Celts literally “tied the knot” at their weddings. Perhaps you can incorporate hand-fasting into your ceremony in place of the traditional candle. I absolutely love this tradition- so much so, that I used it myself! Carry an Irish linen kerchief that can one day be converted to your baby’s christening cap, and passed down as a family heirloom. In America, fruitcake has earned a well-deserved, bad reputation; but it’s the traditional Irish wedding cake! As a guest-approved twist, ask your baker about alternative ways to enjoy fruit-laced cakes. Ireland boasts so many lovely poems, and eloquent speeches- it would be a shame to pass them over for this occasion! Below is my favorite- it’s perfect for lettering and toasts. Tradition dictates that when the couple leaves for their new life, guests would throw their shoe at the bride. As tempting as that sounds, let’s look at another way the Irish bid their newlyweds farewell. Guests ring little bells during the exit (in order to ward off bad luck and spirits- and because it’s fun!). Regardless of how you pay tribute to Irish heritage in your wedding- or any heritage, for that matter- keep it subtle and graceful to avoid stereotypes. If you plan to incorporate traditions from your history, leave a comment and tell us; we’d love to hear about it!